Bringing in all the newest lines and fashion daily, coming based out of New York, NY. 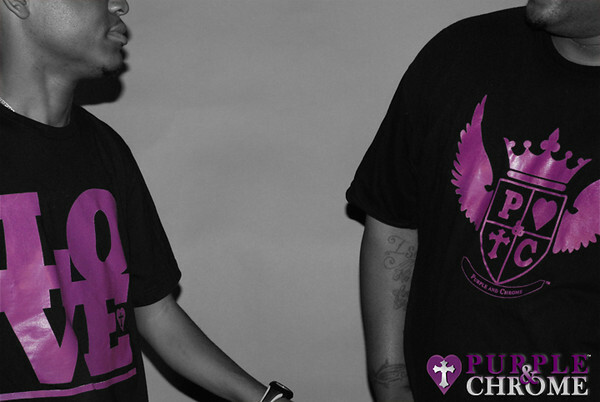 We bring you an exclusive fashion interview with an up & coming brand by the name of “Purple & Chrome”. 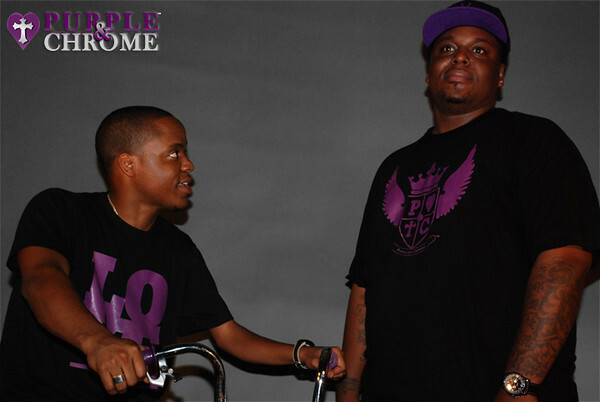 Relax as we get to know the Purple & Chrome more and how they started their brand! 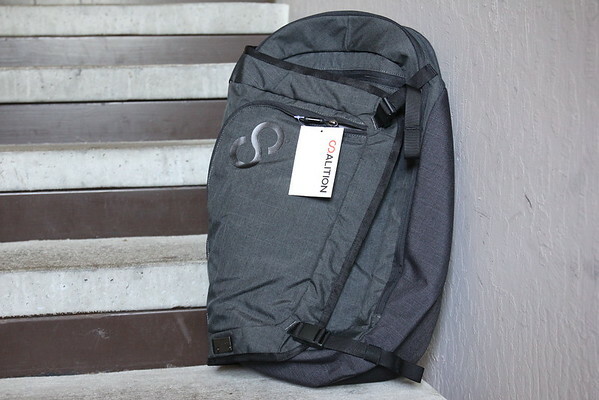 So tell us about yourself and your brand? – What’s going on fkn-famous and fkn-famous readers? Rashaun Burgess here! Who is RaShaun? I am just your average guy who got tired of living an average life and decided to be extra-ordinary. Now, do I really think I’m average? No! But I use the word average because I’m no different than anyone else in the world. Like everyone else I get frustrated and tired of working a 9-5 job making someone else richer, making someone else’s dreams come true, making the dreams of their loved ones come true. Not that they shouldn’t have it but what about my dreams and that of my loved ones? I know we ALL have been there before; some of us are there now! 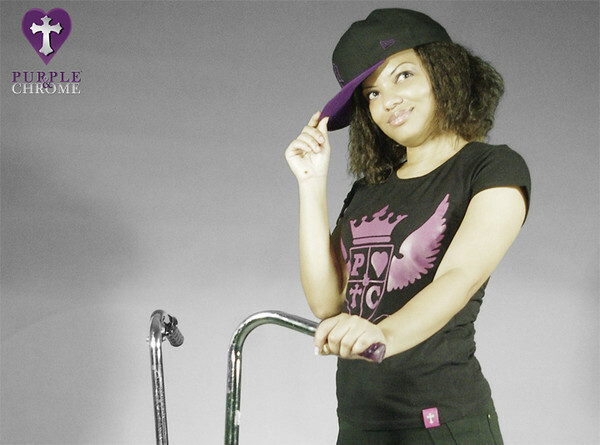 So… it’s been a dream of mine to start my own business; now here is my indie clothing company Purple & Chrome. We have big bold designs with a big bold message. – Purple is a really cool color. It represents royalty, knowledge, wisdom, things of that nature. So…I wanted to use the color purple. I like the color silver/chrome because to me, it represents being strong and polished so I knew that I wanted to use the color chrome also! In terms of what the business was going to be about it was essentially going to be “ME” since I’m giving myself to this and just doing me so I knew I wanted to use the word heart. With all that in mind I was just brainstorming different names like Purple Heart or Chrome Heart. But, when I did the research I saw they were already being used. I thought to myself how can I use these words but not take a name that’s already in use. That’s when I thought to just keep Purple & Chrome; at the same time the logo would be a chrome cross inside of a purple heart. When I came up with it I knew that was it! – Purple & Chrome is a t-shirt company that aims to spread positivity, fun, and love in the world. I know many people share some of the ideals and thoughts we do. You know the saying “wear your heart on your sleeve”? Well… we are wearing ours on our back. Purple & Chrome came about as a way for us to express our thoughts, passions, fears and joys. Many people write poetry, some paint pictures, and others sing songs. We… make t-shirts. The Purple & Chrome logo is a chrome cross inside of a purple heart. People may see the cross and think that Purple & Chrome is a religious or Christian clothing company for the like. Let me set the record straight and say that totally isn’t the case. 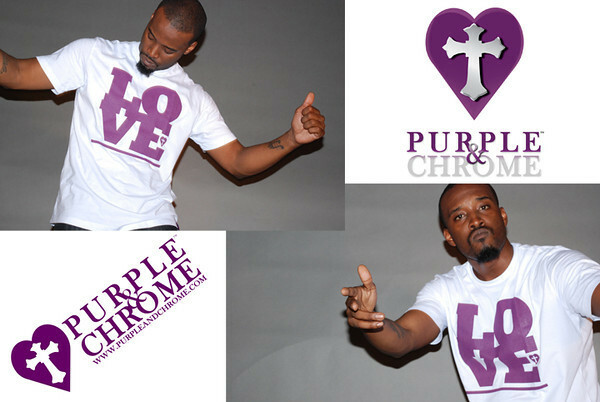 Purple & Chrome is a brand targeted to anyone who’s down with peace, positivity, fun and love! I think those things are universal no matter what color, creed, or religious background you come from. Yes, because Purple & Chrome is essentially who I am, you will see some touches here and there of what I believe but really, it’s for anyone that wants to express themselves in a positive way. – Since I was about 13 I’ve been trying to get ahead in life and start my own things. I use to work at Jones Beach when I was younger; did a bunch of other jobs too but even then I was beginning to realize that working for someone else wasn’t going to be my life’s goal feel me? I would watch my mom, a single mother of two boys, work two jobs to make ends meet. I didn’t like seeing her work so hard coming in from work tired as hell after a long long day every day. I wanted to “hurry up and get rich” so I could take care of mom and our family be good you know. I tried my hand at being an independent financial consultant, selling life insurance, and a ton of other things to name a few. I even had my own little biz on eBay. Nothing seemed to work. At one point I started a Roller Skating Crew with my brother and our two best boys. I was excited as ever because we were having fun and I thought this was it! But that too didn’t work out as planned! At that point I was just mind boggled as to why nothing I’ve tried was working out for me. Shortly after that, one day in August 2010 it just dawned on me that I was making this all too hard. The answer for me was a lot easier… just keep it simple and do what was on my heart to do. Just do me! The one thing I can do better than anyone else in the world is be me. Things are a lot simpler when you be yourself and just do you! That’s when the idea of Purple & Chrome was born. – As I look at other brands out there I don’t see the essence or soul behind the brand. I look around at other brands and they say that they are a “Lifestyle” brand. But I think to myself “what does that mean?” How you live is all determined by your thoughts and beliefs. Purple & Chrome is a different type of brand all on its own. I look at Purple & Chrome as a “Mindstyle” brand. It’s more a philosophy/outlook on life; a way of looking at the world and life with open eyes, minds, hearts and spirits. That’s what and who we are. To some, I know this sounds like some mumbo jumbo bulls%$& but at the same time I know there are those out there that feel what I’m talking about. LOL. – Where do I start?! LOL. There are tons of challenges! For one, and this is probably a major for a lot of people running their own business, being properly funded is a big challenge. You may have the hottest clothing coming but if you don’t have the capital needed to bring your line to the market, then no one will even see it. Or if you bring it to the market and can’t keep it afloat until it starts running on its own revenues then that’s a challenge also. The competition in the apparel industry is a great challenge too! There are so many more brands out here doing it that it pushes you to go harder. It also makes you realize that you really have to stand out from the rest if anyone is going to really see you. Another challenge for me when running my business is just having the energy to wear all the different hats you have to wear as a business owner. If you don’t have partners, you have to be the business admin, the webmaster, social media person, marketer, salesman, customer service, and the list goes on and on! There’s only so many hours in a day, days in a week and so on. But it’s not so much a challenge for me though because I love what I am doing! As long as you love what you do it’s not work; it’s just having fun and hopefully making money at the same time! LOL. And you know what, it will be a challenge because it’s not easy by far but it will be worthwhile. When I get to the point when I can hire other people to wear some of the hats then I’ll know that I’m doing something right! – Well that is always a work in progress. What worked in the past isn’t going to work all the time or forever. The thing that’s working for me right now is social media. A lot of people say that but it really is an amazing way to reach so many people you can’t physically reach out and touch, you know what I mean? 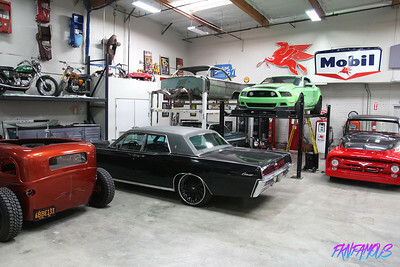 I focus mainly on twitter @PurpleandChrome and facebook, www.facebook.com/purpleandchrome. These things can take up a lot of your time but if you do it right you can do it efficiently and still get good results. One of the best things of all about social media is that it is predominantly free! It only costs time. Like I said above about not having capital to fund the biz, you don’t want to be spending tons of money in advertising and just having conversations with people when you can do it for free. – There are tons of future plans for Purple & Chrome. Right now since we are new, we just do tshirts but, of course, I want to do other things such as hoodies, sweat shirts, tanks, and accessories. All that will come in time though and as we grow. I want to expand the Purple & Chrome team so that the various tasks needed to be done can be shared and completed more efficiently. This will also allow us to always be bettering the designs and loud message of our tees. Doing trade shows and getting into stores is also something that I think we need to do to build brand exposure and get the name out. From a business standpoint we want to get more heavily involved in community programs and events; if we could do something with Mos Def, Talib Kweli, Common, or the Roots that would be crazy! I know those dudes are heavily involved in community action as well! The overall goal is mainly to just help people however we can on a local, national, and global stage. – Before I do anything I like to do my research and see what’s what out there. While looking around a stumbled upon FKN Famous and I’m glad I did! FKN Famous is a dope site! In anything that you do, you need to stay up to date on the current happenings and what’s going on. FKN Famous is definitely the place to be and the place to do that. Big shout outs to Jerry Rodrigo and the FKN Famous team for keeping us in the know! I would definitely love to work with the FKN Famous team more. – First I want to give major shout outs to Jerry and the FKN Famous team for doing what they do with fkn-famous.com! Secondly, I want to thank all the naysayers and haters out there for giving me and my fellow people out here doing what they do the motivation to do it big and to keep going! Last but most certainly not least, I want to thank all Purple & Chrome family and friends (that includes customers, fans, and supporters) for giving us the inspiration to spread this positivity, fun, and love in the world. We can never have too much of that! Agree? No doubt. I want to encourage everyone to follow @PurpleandChrome on twitter at www.twitter.com/PurpleandChrome and to like us on facebook at www.facebook.com/PurpleandChrome. Thank you again to all! Stay tuned for a whole lot more! 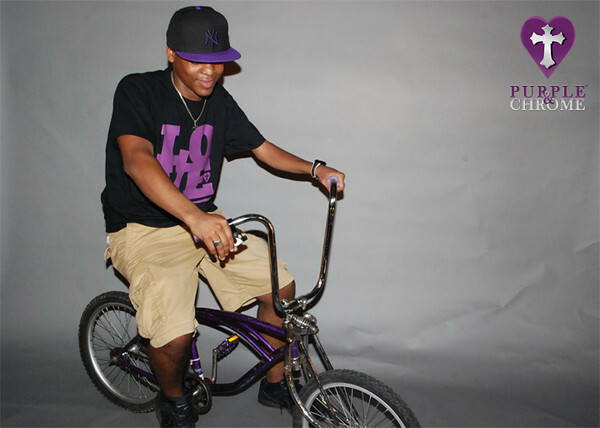 This is RaShaun of Purple & Chrome… Peace Peace.